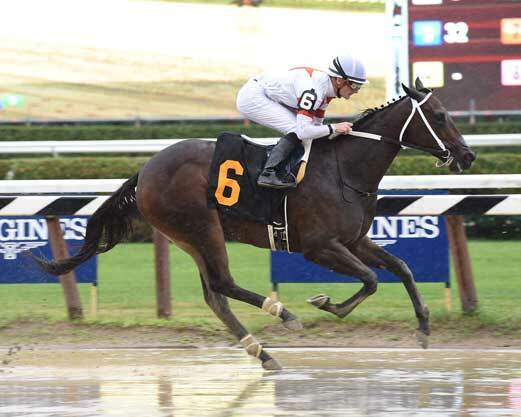 Celebrity Chef Bobby Flay has purchased an interest in talented two-year-old filly Runway Doll. Runway Doll broke her Maiden on July 31st at Saratoga in her debut. She was quick out of the gate going the first quarter in :22.73 under Julien Leparoux. Co-favorite Blind Pool came up the rail to challenge but she was turned away by Runway Doll. She spurted away to win by a stunning 13 1/2 lengths in the end! She was named a “TDN Rising Star” and was clearly one of the most impressive maiden winners at the Spa thus far in the 2016 meeting. Runway Doll was a $175,000 OBS April graduate after going :9.4 for an 1/8th of a mile at the sale. BSW Bloodstock brokered the deal between owners Bill and Corinne Heilgbrodt and Bobby Flay to become partners on the filly moving forward. BSW Bloodstock has close ties to Flay’s equine operation and was also the group behind Flay’s purchase into G1 Belmont Stakes winner Creator, G1 Prioress winner Her Smile, G2 Breeders’ Cup Juvenile Turf winner More Than Real and G3 Tampa Bay Oaks winner Quality Rocks. Runway Doll will continue to be trained by Steve Asmussen and point for the (G1) Spinaway Stakes on Saturday, September 3rd.